No of course it isn't! 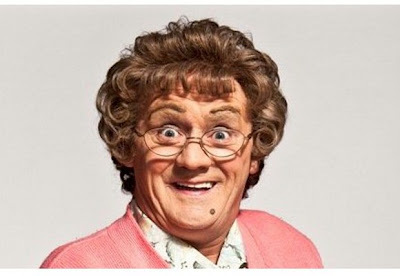 It's Brendan O'Carroll who has had huge success here in Ireland with his TV show Mrs Brown's Boys. It's also on BBC in the UK. It''s a show that is completely stereotypical in a lot of respects. The depiction of the gay son and his boyfriend often make me want to switch off but O'Carroll ridicules everyone as is the overall style of the show. The clip below features Mrs Brown mistakingly believing that it is her daughter Cathy who is gay and not her son. She confines in her best friend Winnie and it's v funny. Bingo will never be the same again.